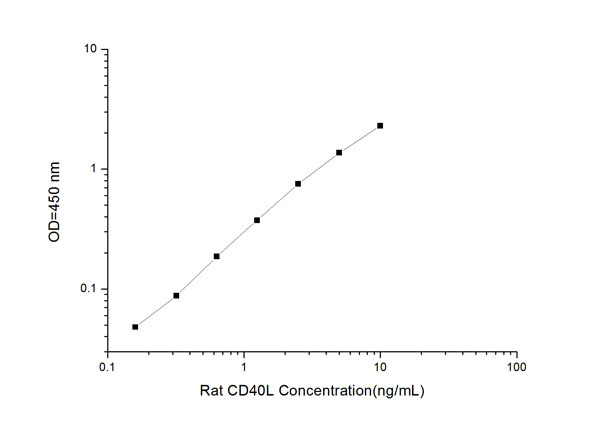 This assay has high sensitivity and excellent specificity for detection of Rat CD40L. No significant cross-reactivity or interference between Rat CD40L and analogues was observed. Note: Limited by current skills and knowledge, it is impossible for us to complete the cross- reactivity detection between Rat CD40L and all the analogues, therefore, cross reaction may still exist. Small volumes of CD40L elisa kit vial(s) may occasionally become entrapped in the seal of the product vial during shipment and storage. If necessary, briefly centrifuge the vial on a tabletop centrifuge to dislodge any liquid in the container`s cap. Certain products may require to ship with dry ice and additional dry ice fee may apply. MBS2510698 is a ready-to-use microwell, strip plate ELISA (enzyme-linked immunosorbent assay) Kit for analyzing the presence of the CD40L, ELISA Kit target analytes in biological samples. The concentration gradients of the kit standards or positive controls render a theoretical kit detection range in biological research samples containing CD40L. The ELISA analytical biochemical technique of the MBS2510698 kit is based on CD40L antibody-CD40L antigen interactions (immunosorbency) and an HRP colorimetric detection system to detect CD40L antigen targets in samples. The ELISA Kit is designed to detect native, not recombinant, CD40L. Appropriate sample types may include undiluted body fluids and/or tissue homogenates, secretions. Quality control assays assessing reproducibility identified the intra-assay CV (%) and inter-assay CV(%). Principle of the Assay: This ELISA kit uses Sandwich-ELISA as the method. The micro ELISA plate provided in this kit has been pre-coated with an antibody specific to Rat CD40L. Standards or samples are added to the appropriate micro ELISA plate wells and bound by the specific antibody. Then a biotinylated detection antibody specific for Rat CD40L and Avidin-Horseradish Peroxidase (HRP) conjugate is added to each micro plate well successively and incubated. Free components are washed away. The substrate solution is added to each well. Only those wells that contain Rat CD40L, biotinylated detection antibody and Avidin-HRP conjugate will appear blue in color. The enzyme-substrate reaction is terminated by the addition of a sulphuric acid solution and the color turns yellow. The optical density (OD) is measured spectrophotometrically at a wavelength of 450 nm +/- 2 nm. The OD value is proportional to the concentration of Rat CD40L. You can calculate the concentration of Rat CD40L in the samples by comparing the OD of the samples to the standard curve. NCBI/Uniprot data below describe general gene information for CD40L. It may not necessarily be applicable to this product. CD40LG: Mediates B-cell proliferation in the absence of co- stimulus as well as IgE production in the presence of IL-4. Involved in immunoglobulin class switching. Defects in CD40LG are the cause of X-linked immunodeficiency with hyper-IgM type 1 (HIGM1); also known as X-linked hyper IgM syndrome (XHIM). HIGM1 is an immunoglobulin isotype switch defect characterized by elevated concentrations of serum IgM and decreased amounts of all other isotypes. Affected males present at an early age (usually within the first year of life) recurrent bacterial and opportunistic infections, including Pneumocystis carinii pneumonia and intractable diarrhea due to cryptosporidium infection. Despite substitution treatment with intravenous immunoglobulin, the overall prognosis is rather poor, with a death rate of about 10% before adolescence. Belongs to the tumor necrosis factor family. 1. Ten distinct CD40L mutations (six novel) have been identified in a small cohort of Chinese patients with hyper-IgM syndrome type 1.